THE BOTTOM LINE GEN-NEX is the only container in the industry that can hang on your wall, hang in groups on mobil or stationary racks and empty easily through it's bottom sliding door. 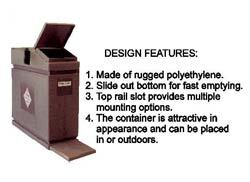 Our unique design (patent pending) enables your business to handle recyclables or refuse with less worker stress and greater placement convenience than any other container in the industry. Gen-Nex Engineering, 793 Nathan Avenue, North Liberty, IA 52317. Tel: 319-626-7677; Fax: 319-626-7677.